Spring weather is almost here and summer is just around the corner. It is time to start wardrobe planning for the warmer months ahead. Here is a (hopefully!) 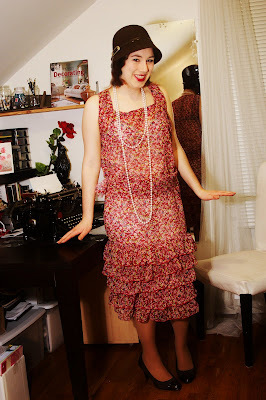 simple tutorial for a 1920's inspired dress. Note: All seam allowances are 5/8” unless otherwise stated. Most of my seams were also finished with pinking sheers. 1) Cut out two armhole facings and two large rectangles. The rectangles should be half the width of the widest part of your body plus 2 inches (I made mine 22” wide since my hips are about a 40”) and the length should be 2 or 3 inches longer then the desired length of your dress. 2) Decide what type of neckline you would like (I did a square neckline for my dress). 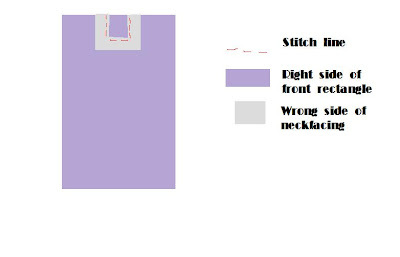 Cut out a facing for the neckline (as shown in the diagram below) and sew right sides together to the top-center of one of the rectangles. 3) Cut out the excess material on the top of the rectangle. Turn the facing inside the dress then stitch in place to finish the neck of the dress. You should stitch very close to the edge of the neckline. 4) With right sides together, stitch the top of the two rectangles together. Press the seam open and stitch along the back part of the neck opening. Stitch very close to the edge like you did for the front of the neckline. 5) With right sides together, sew the sides of the rectangles together leaving a 2 inch gap at the top. 6) Sew your armhole facings according to the original patterns instructions (this will likely be only one seam joining the short edges to make a circle). With dress right side out, pin the armhole facings to the dress. It may take a bit of time to correctly position them on the rectangle. 7) Cut out some of the extra fabric on the inside of the armhole and sew the facings to the dress. The stitch line is shown in red in the below picture. Turn facings to the inside of the dress and stitch in place (as was done for the neckline). 8) Hem the bottom of the dress as required. Attach the trim if you are using any. This dress would look great with some beaded trim around the bottom (I looked everywhere for some but I couldn't find any in my price range!). 9) Cut strip of fabric about 3 ½ “ wide and 5 inches longer than your hip measurement. Use a zigzag stitch to finish the edges. This will be your waist tie. When wearing your dress, simply tie this around your hips to give the effect of a 20's style dropped waist. Let me know if you have any questions or suggestions for tutorials you would like to see! Great job on these darling dresses! Love the accessoires, too! Awesome! That looks easy enough that even I might be able to do it. These turned out so cute! I really want to try them!! Old Photos, Books, and an Award!